Crumble the feta into a small bowl. Add the chopped mint and toss; set aside. Season the tomato slices with salt and then arrange them, overlapping slightly, on a serving platter. Sprinkle the cucumber over the tomato slices. Season the bite-size tomatoes with salt and scatter them over the cucumber. Sprinkle the olives on top. In a small bowl, whisk together the olive oil, lemon zest, and lemon juice. Season to taste with salt and pepper. Drizzle the vinaigrette over the salad. 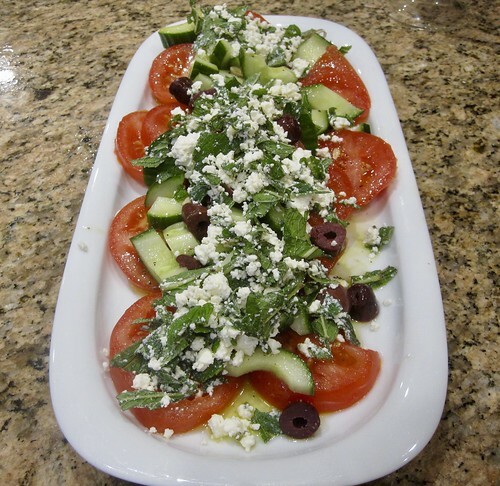 To serve, scatter the feta over the salad, garnish with the mint sprigs, and serve immediately.